Camden Ballantyne defines suburban splendor! Our one, two and three bedroom apartment and townhomes offer upgrades for those with impeccable taste. Stainless steel appliances, custom cabinetry, expansive walk-in closets, designer lighting and full-size washer and dryer are just a few of the spectacular reasons to call Camden Ballantyne home. Doorstep waste removal service and options for attached garages are a few more reasons to call these incredible apartments home. When it comes to relaxing, our non-smoking community offers resort quality amenities including a spectacular saltwater swimming pool, volleyball and tennis courts and two level fitness studio with cardio equipment, universal trainer, free weights and towel service. Perfectly situated in the heart of Ballantyne you will have easy access to shopping and dining at Ballantyne Village and StoneCrest at Piper Glen, the area’s best schools and I-485. Walking distance to Harris Teeter and a short drive to Earth Fare and Publix makes trips to the grocery store a breeze. Not in the mood to cook? Walk over to restaurants and night life like Mellow Mushroom, Fox and Hound, Duckworth’s, Libretto’s and Black Finn’s. 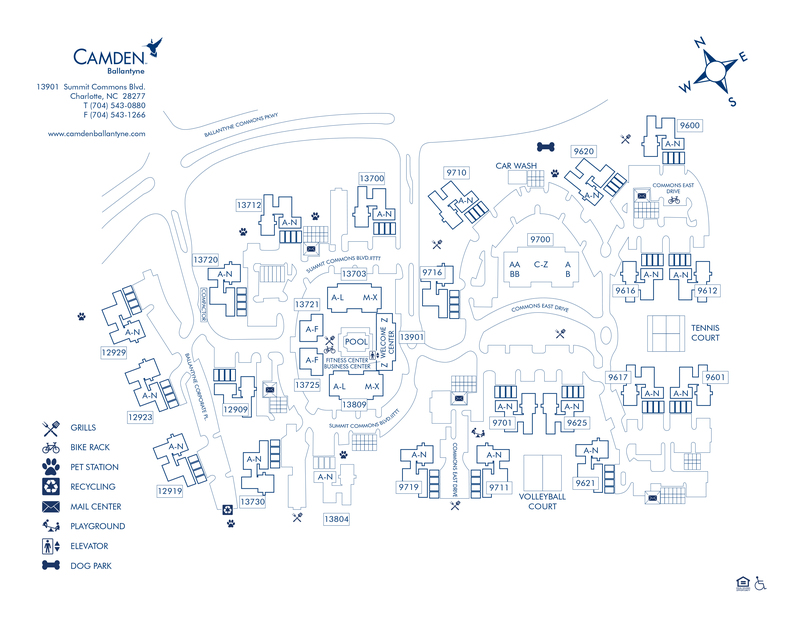 With all this and more the choice is easy – make Camden Ballantyne your new home today! At Camden, your pets are family too! We welcome cats and dogs, up to two pets per apartment home, with no weight limit. Call us with any pet-related questions! We'll save a spot for you! We offer two parking spaces per apartment home on a first-come first-come, first-served basis. Garages are available for you to rent too! We offer both attached and detached garages for $100 per month. Some apartment homes may not have the option for attached garages.